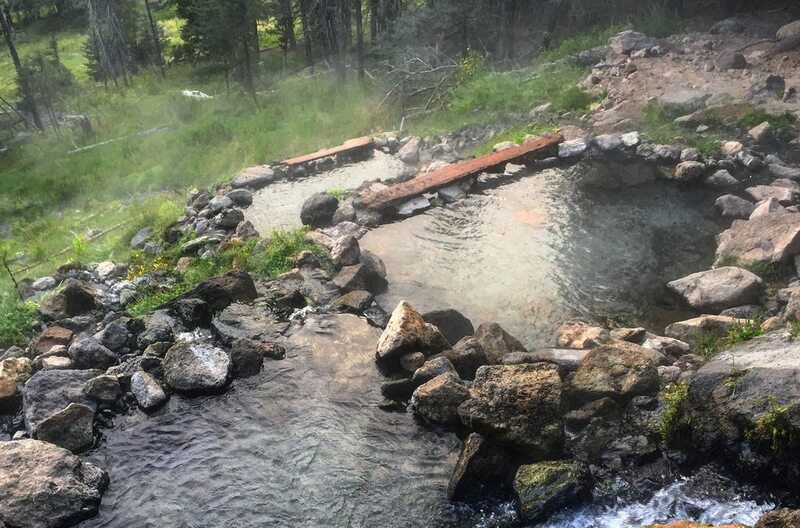 As the name implies, Jemez Springs is abundant in natural hot springs which derive from the super volcano, the Valles Caldera National Preserve just 17 miles north. Several primitive hot springs make Jemez Springs a delight for hikers who are rewarded by beautiful waterfalls or comforting hot springs. 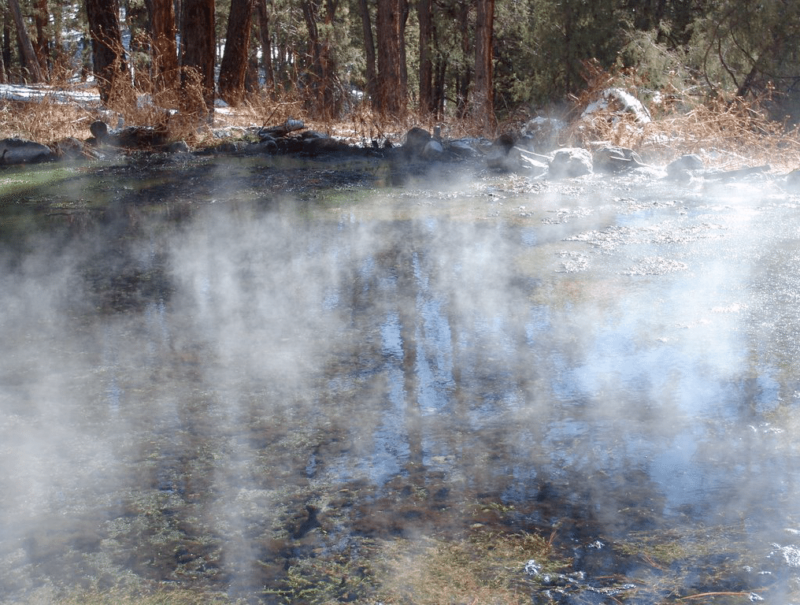 Spence Hot Springs near Soda Dam, McCauley Hot Springs close to Battleship Rock, and San Antonio Hot Springs in the Santa Fe National Forest are accessible via hikes ranging from easy to challenging. Commercial hot springs, spas and bath houses in Jemez Springs provide a more controlled, cleaner environment in which to soak and relax. Whether its soaking your cares away under a starry sky or taking advantage of an herbal wrap or massage, Jemez Springs’ facilities are reasonably priced yet top notch. 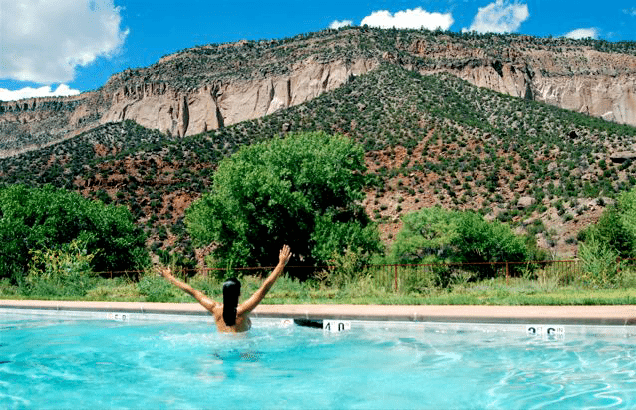 Formerly “Giggling Springs,” Jemez Hot Springs was renovated in 2016 and has four outdoor pools with over 17 healing minerals in the water along with shade and pool side service. Accommodates up to 50. 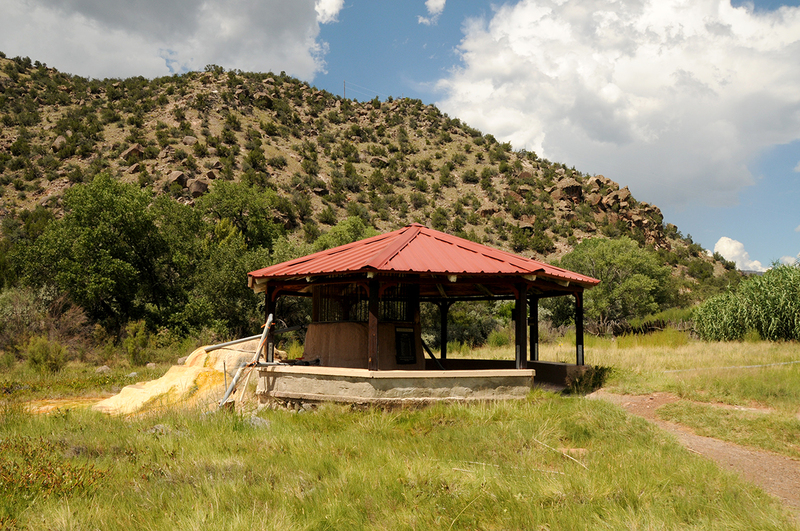 Jemez Hot Springs is located along the Jemez River with a view of colorful Virgin Mesa outdoors under the stars. Indoor gallery. Open 11 a.m. 5 p.m. Christmas Eve, Christmas Day, New Year’s Eve and New Year’s Day. Visit website for additional information. Jemez Springs Bath House will be temporarily closed while they improve the interior of the building from Jan. 14-Feb. 9. Thank for your patience as we improve! Village owned, the bath house is over 100 years old and is a State Historical Site. From half hour soaks to wraps and other services, the facility includes four massage treatment rooms and eight bath tubs. The original rock enclosure where the original geyser was established in 1860 is on site. Free soaks on birthdays. Read more about Jemez Springs Bath House here. Open 10 a.m. to 2 p.m. on Christmas Eve. Closed Christmas Day and December 26. Reopens Dec. 27 for normal business hours. Open New Year’s Eve, from 10 a.m. to 4 p.m. and New Year’s Day from 12-5 p.m. Closed for cleaning on Wednesdays. 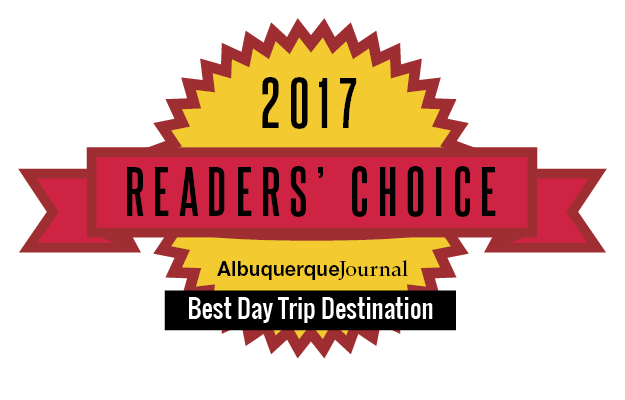 Featuring six individually decorated adobe style rooms, outdoor swimming pool with view of Virgin Mesa, art gallery, spa services and hot tub. Located along the Jemez River, the facility includes top notch breakfast and large dining area for large groups. Closed Christmas Day. Call for more information. 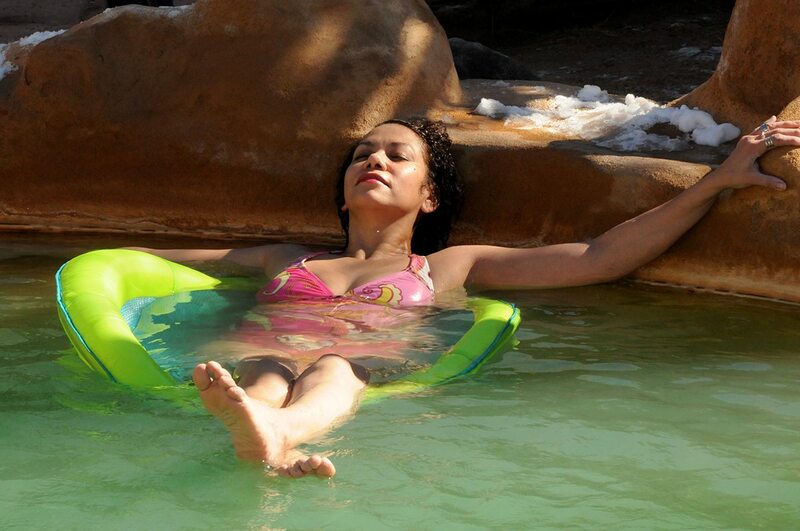 The following hot springs are on public land and are for day-use only (sunrise to sunset). Overnight camping is prohibited at these locations. There are no facilities at these locations. Bathing suits are required. Littering and fires are strictly prohibited. These springs are administered by the US Forest Service (local headquarters at the north end of the Village of Jemez Springs, just south of Soda Dam). The phone number for current spring conditions and accessibility is 575-829-3535. 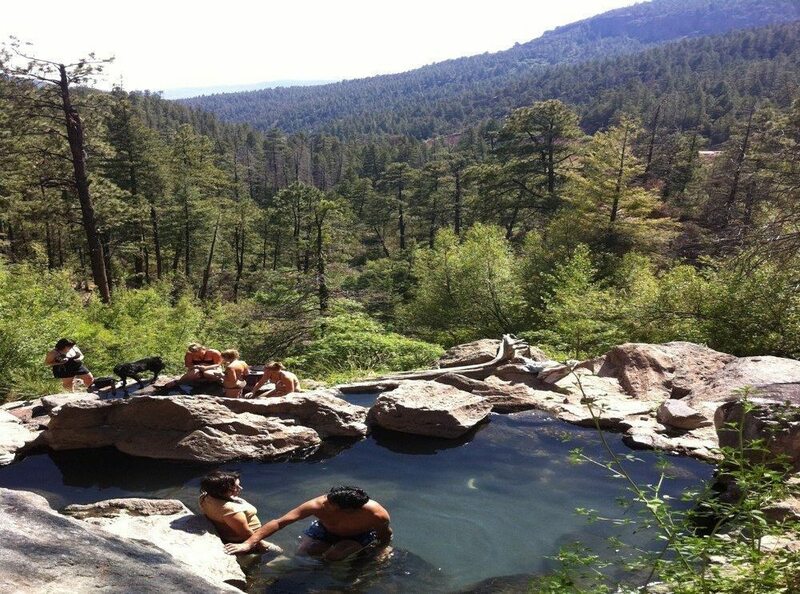 Located between Battleship Rock and Jemez Falls, McCauley is a 3.8 mile loop with two warm pools. Hiking trail 137 can be accessed via Battleship Rock picnic area. Located seven miles north of Jemez Springs. One of the most heavily visited of primitive hot springs. Large parking lot on the east side of highway 4, follow the short trail down to the river and up the other side to the springs. Spring maintains 95 degree temps. Located nine miles north of Jemez Springs, this spring is set in the beauty of the Santa Fe National Forest. Park at Forest Rd. 376 north, then hike five miles to the spring whose temperature hovers around 129 degrees. Unplug, reconnect in Jemez Springs.